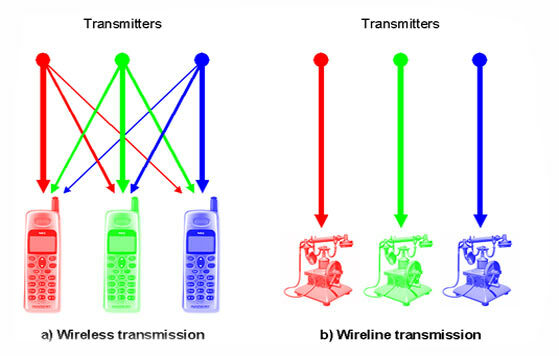 Reflection, diffraction and scattering are the three basic propagation mechanisms that impact propagation in mobile communication systems. They are briefly explained below. Reflection occurs when a propagating electromagnetic wave impinges upon an object that has very large dimensions compared to the wavelength of propagating wave. Reflection occurs from the surface of the ground, from walls, and from furniture. When reflection occurs, the wave may also be partially refracted. The coefficients of reflection and refraction are functions of material properties of the medium, and generally depend on the wave polarization, the angle of incidence, and the frequency of propagation wave. Diffraction occurs when the radio path between the transmitter and receiver is obstructed by a surface that has sharp edges.The waves produced by the obstructing surface are present throughout space and even behind the obstacle, giving rise to the bending of waves around the obstacle, even when a Line Of Sight (LOS) path does not exist between the transmitter and receiver. At high frequencies, diffraction-like reflection-depends on the geometry of the object, as well as on the amplitude, phase and polarization of the incident wave at the point of diffraction. Scattering occurs when the medium through which the wave propagates consists of objects with dimensions that are small compared to the wavelength, and where the number of obstacles per unit volume is large. Scattered waves are produced by rough surfaces, small objects, or by other irregularities in the channel. In practice, foliage, streetsigns, lampposts and stairs within buildings can induce scattering in mobile-communication systems. A sound knowledge of the physical details of the objects can be used to accurately predict the scattered signal strength. With the growth in the capacity of mobile communications, the size of a cell is becoming smaller and smaller: from macro cell to microcell and them to picocell.The service environments include both outdoor and indoor areas. When propagation is considered in an outdoor environment, one is primarily interested in three types of areas: urban, suburban and rural areas. The terrain profile of a particular area also needs to be taken into account. The terrain profile may vary from a simple, curved earth to a highly mountainous region. The presence of trees, buildings, moving cars and other obstacles must also be considered. The direct path, reflections from the ground and buildings, and diffraction from the corners and roofs of buildings are the main contributions to the total field generated at a receiver, due to radio- wave propagation. With the advent of Personal Communication Systems (PCAS), there is also a great deal of interest in characterizing radio propagation inside buildings. The indoor radio channel differs from the traditional outdoor mobile radio channel in two aspects: the distance covered in much smaller, and the variability of the environment is much greater for a much smaller range of transmitter and receiver separation distances. Propagation into and inside buildings has, to some extent, a more complex multipath structure than an outdoor propagation environment. This is mainly because of the nature of the structures used for the buildings, the layout of rooms and, most importantly, the type of construction materials used.